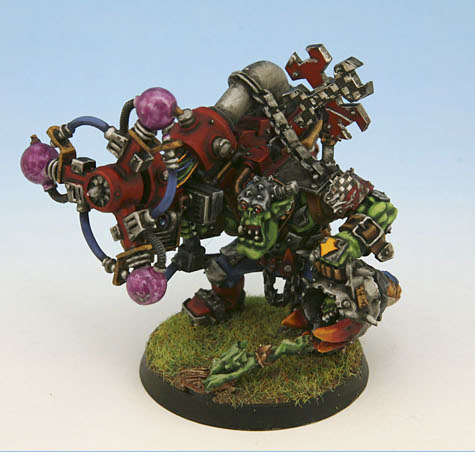 Back in 2002 I was a http://www.strolf.com/ to all this Warhammer 40k hobby stuff. Oh, I played the occasional game since 1996 and had some of the models but lacked experience at the totality. I decided to learn more and hit the internet. My eyes were opened and I learned so much in those first couple of years I decided I was going to write a gigantic book/website of sorts. It was going to be the book/resource I wished I had when I started really getting into it. This, of course, was during the Wild West days the internet when the world of miniature painting was pretty small in this brave new world. Fast forward to present day. The internet has become a vast resource for almost anything you would want to learn about 40K and modeling. It’s astounding the dearth on knowledge now out there compared to back then. I really wasn’t kidding either about writing a book… I’ve got a ton of material I’ve written over the years – but never published it. I’ve been posting progress of my work on a lot of major forums but there wasn’t anything that comprised a consolidated resource for all of that knowledge I’ve acquired since then. That’s going to change now. The Big Mek Manual is going to be my collection of knowledge I’ve gained over the years. I want this to be a resource for both newbie gamer/modelers and for seasoned vets alike (although I don’t propose to teach too many old dogs new tricks). I’ll be starting this out with an introduction I wrote many years ago about how and why I decided to take up this particular mantle. It’s basically a three page rant about why I think I might be particularly suited to this hobby and present myself as a semi-authority on the subjects I’ll be presenting. The meat for all the new people will start with the absolute basics – really simple stuff. Tools, working environment, places to seek inspiration (other than here 🙂 ). I’ll then move on to things like working with metals versus plastics, different paint types and primers, glues and adhesives and more. Once I have all the articles for the basic hobby knowledge I’ll branch out into things that need those foundations like blending, scratchbuilding/kitbashing (otherwise known as Looting), airbrushing and more. I’ll also be dropping tips and tricks through out the articles as there are always little things even the most experienced modeler may pick up (even like me). What I won’t be showing is how to win a Golden Demon or sculpt with greenstuff/putty. There’s a lot I can show you but these are two areas I don’t have experience in (yet). If you’re still here and figure you might take a further look, the menu at right will show you what’s available as I get the articles online. I’ll also try to post in my blogs when I add a new section or article. In time, I hope this becomes a valued resource for new and old modelers of all stripes. If you have any feedback, questions, or suggestions for future topics, please email me.